Also, did Robert Frost ever write anything on unicycles? Whenever I look at this picture, the only two words that pop into my head are "Robert Frost". For some reason. Given the paved nature of this road, it doesn't look like this was the road Frost would've taken. Hell, there isn't even a fence to be good neighbors with! On another thought, it would be AWESOME to have this type of police chase turned into a TV special - I think the FOX Network's already got a head start - America's Wildest Unicycle Chases! Is this another Uni-Jacking? I hate those! 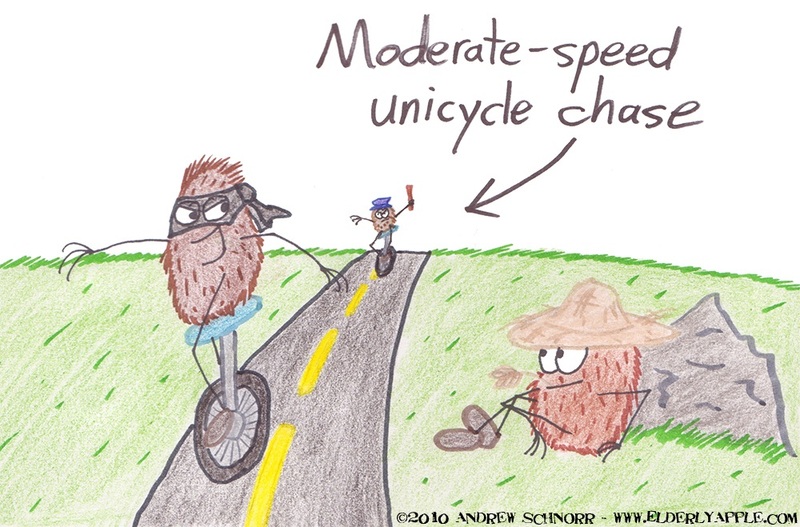 What (whom) exactly are riding said unicycles? The shaggy nature of these characters is throwing me. maybe you should have been an english major. EVRYTHING is supposed to remind us of robert frost. and julie: read the tags. it's in the tags! he even explained it directly last week!